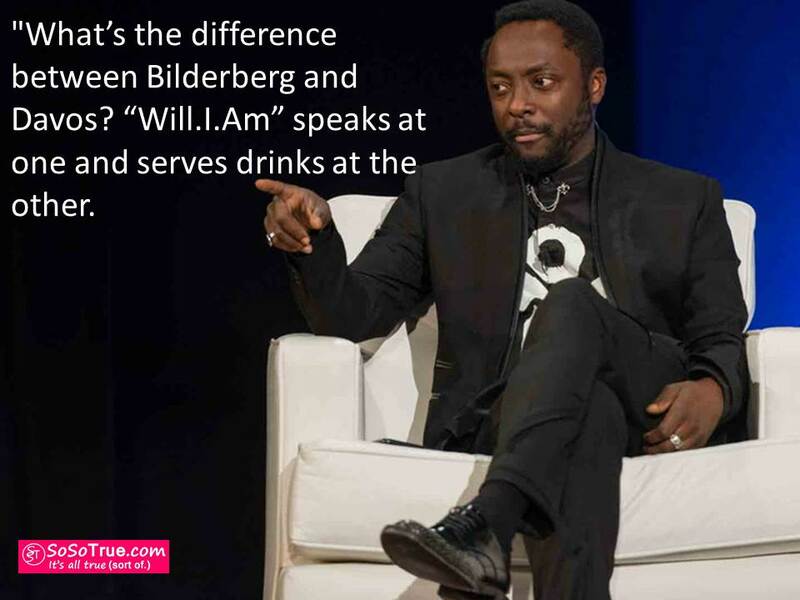 Will.I.Am asks at Davos 2016 “What you gon’ do with all that junk? All that junk inside that trunk?? Low and behold Will.I.Am was invited to Davos for a second time. Confirming this wasn’t a bizarre administrative error; rather some of Davos organisation cannily intuitively thought that his vanity, stupidity, and ability to say the most vacuous statements possible would fit in well with world political leaders and business tycoons. What are optimism goggles you ask? Well they could be new line of glasses Will is flogging or they could also be the goggles you put on when your beer googles have been removed; on the hope that your vision and judgment was less impaired than you thought and it was hot model you made love to last night and not a fallen over wheelie bin. This year, in addition his contribution of existential philosophy, he also used the chance to endorse Hillary “Shill to Wall St” Clinton. Clinton is the number one candidate for all non-thinking and vacant celebrities who want to appear political without reading anything beyond a twitter feed here and there. Which I agree with but there is another 150 million women to choose from that aren’t part of some nepotic political dynasty. Anyway, with the likes of Kate Perry, Lena Durham, and Kim Kardashian it appears Will.I.am am is in good company.